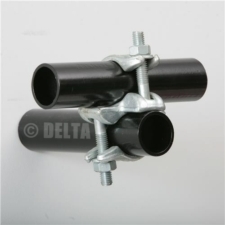 Gate Pivot Scaffolding clamp, normally used in conjunction with gate arms for a loading bay gate, these clamps could also be used in fabrication, set work or other applications where objects need to be attached or hung from scaffolding. 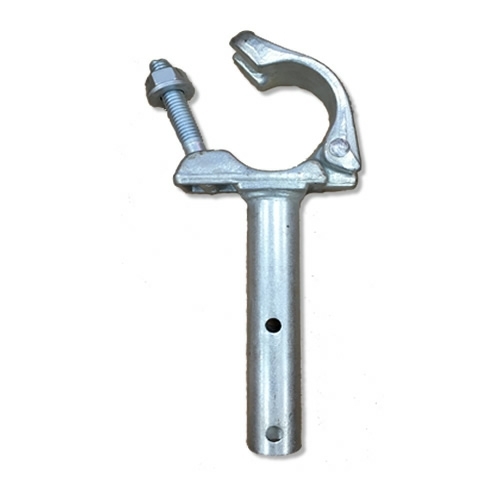 Made from a Drop Forged Half Swivel clamp by Strongforge, this scaffolding fitting has a 140mm long tube welded to the base of the coupler. 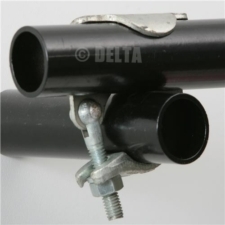 The tube part of this item has a 26.9mm outside diameter and has been pre drilled with 2 pairs of 8mm holes. 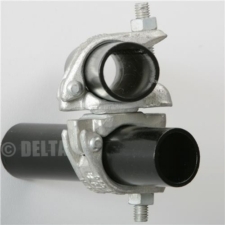 The distance from the fitting to the first hole is 70mm. The distance between the first and second hole is 50mm. 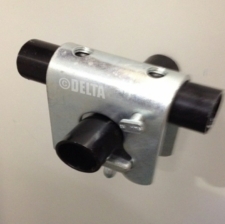 The half swivel fitting is manufactured to BS1139 (Part 2) & EN74 and tested to ensure the highest level of quality control. Used to make steps sticking out the side of a scaff pole - plenty sturdy enough and easy to use.